Today is my day off from work. I had planned to volunteer at a local restaurant (Robin des Bois). The owner donates all profits to non-for-profit organizations. Sadly, upon arrival, the manager kindly informed me that there was a mistake and that they already had enough volunteers for the day. They felt bad enough to give me coffee and lunch to go. Grilled artisanal bread topped with sweet and white potato, wild mushrooms, Emmental cheese and a white sauce (probably some kind of bechamel). I made the salad below to accompany the broiled open-faced sandwich. Perhaps I’ll try volunteering some other time. To remove seeds from pomegranate, cut fruit in quarters in a bowl filled with cold water. With a spoon, scoop out the seeds. The seeds with sink and the membranes will float. Roast hazelnuts in a 375F degrees oven for about 10-15 minutes. Divide baby spinach into 4 plates. 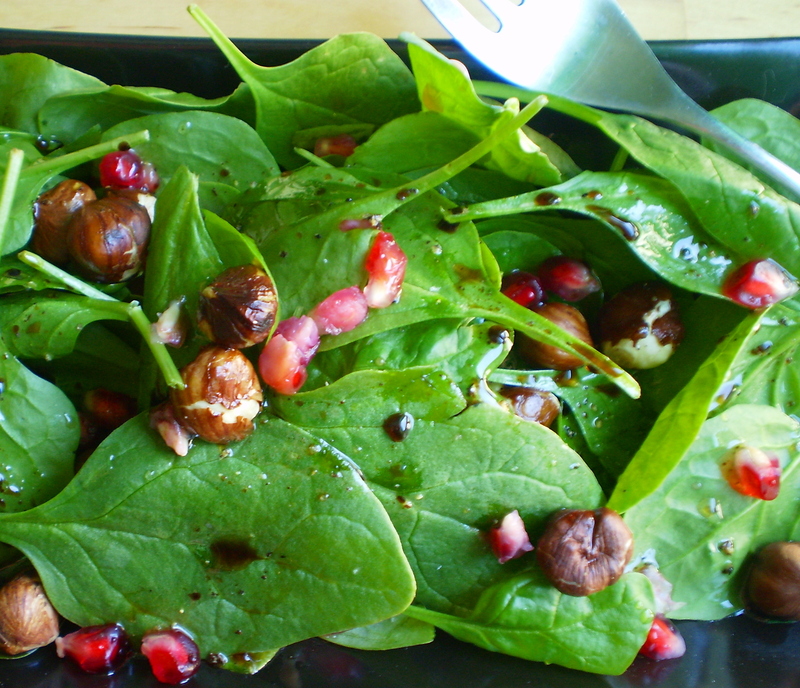 Top with pomegranate seeds and roasted hazelnuts. Drizzle with maple dressing and sprinkle with fleur de sel. Avocados are a good source of potassium, folate and vitamin C. They are one of my favorite fruit. Their smooth, creamy, almost fluffy texture melts in your mouth. This appetizer is so quick, inexpensive and easy to make. It will even amaze guests. Cut cherry tomatoes in half. Place the tomato halves in a small bowl. Add olive oil, sea salt, pepper and fresh basil. Stir and set aside. Cut the avocado lengthwise around the seed. Gently remove the pit. Delicately remove the skin without damaging the flesh. Place each avocado half in a small plate. Sprinkle with a bit of lemon juice. Stuff each half with tomato/basil mixture. Drizzle with olive oil.